(**GIVEAWAY CLOSED**) I am pretty excited about this post. Not only to share the before and after photos, how to video, but also to give something I really love away to you… FOR FREE (in my best Adam Sandler voice)! Keep scrolling to enter the giveaway (it’s at the bottom)! The main floor of my new home was, honestly, quite boring. Since one day this will be a vacation rental (long term plans, no immediate plans… don’t worry I have a lot of work to do), I decided I could be a little bold in my design choices. The walls were a yellow-y cream color eggshell finish. Yawn! Lucky for us, the finishes are nice. The tile, cabinets and counters are neutral enough to work with, so unlike my Maine home, I don’t need to really do any major renovations. This home will be making smart design choices that make sense and add personality to stand apart from the VAST amount of competition that exists here in the greater Orlando area. Since this wall is central in the open main floor this gave me the perfect opportunity to pack a punch of personality… adding one of two feature walls (this with the most personality, but I have another something planned that I think you will like too!). And it came out as good, if not better than I had expected. Check out the video above for the tutorial on how I did this! I love Cutting Edge stencils! I’ve had my eye on the buffalo check design. You did a great job! I am totally digging buffalo check right now too! I am loving the Chinese Gingko design. I have walls with moulding in my livingroom and this pattern would give it the best pop!! I love it! How fun would that be. Good luck! I love the Mandela stencils. So many cool uses. Love love LOVE how the wall turned out! I really want to do a feature wall in my bedroom! It looks so fun! Love the wall makeover. I’ve interested in trying theses stencils for a while so I’d love to win! 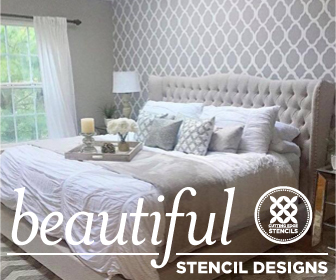 I love the Stacked Slate Allover Stencil, it would be perfect for my bedroom remodel!